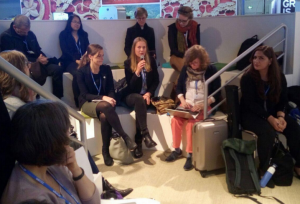 A fish bowl discussion on “Climate Change Multi-stakeholder Diplomacy – Strengthening Linkages and Accountability between Climate Negotiations, Actions and SDGs” during the UN Climate Change Conference (COP23) in Bonn brought together several GDL Members . 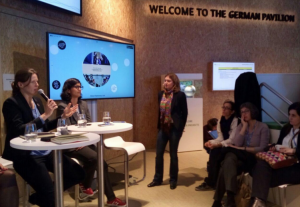 The event was proposed by Edna Martinez and Jasdeep Randhawa and was selected by the German Ministry of the Environment to be showcased as a side event in the German Pavilion. GDL Member Susanne Salz joined the fishbowl as a panelist, while Sabrina Schulz was the moderator, actively integrating GDL members Angelina Davydova, Lina Li, Imran Simmins, Rola Jadallah, Dilshad Muhammad in the discussion. The objective of the event was to have a discussion that moves beyond considering member states and diplomacy as the only solution to implementing the Paris Agreement. It showcased the work and efforts of various non-state actors to exert pressure on decision-makers and to launch their own initiatives to address common global problem. 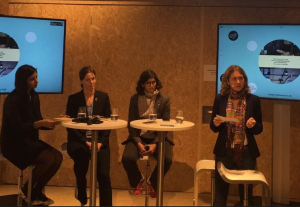 To this end, the GDL panellists outlined their own work in the area of climate change, highlighted the innovative solutions being adopted, and the partnerships being developed to ensure that the commitment to the Paris Agreement is not undermined by the ongoing political dynamics. Furthermore, the event was also spotlight the need to both explore and integrate interlinkages with other SDGs, particularly water, the refugee crisis, health, urbanisation and digital technology. The aim was to stress the need to tackle climate change holistically and urgently, and not just think of it as a technical, political, economic or environmental issue. Rather, it has to be seen as an issue which affects the overall welfare of humanity. 1. What should the future of the Paris Agreement be? 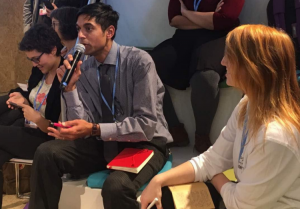 How can the evolving partnerships and initiatives be scaled to sustain the momentum being built outside the formal confines of climate change diplomacy and negotiations among member states? How should these networks be institutionalised? 2. How can communities and these stakeholders leverage pressure and demand accountability from their decision-makers in an effort to try and prevent them from withdrawing from the Paris Agreement? 3. What are the various innovations in addressing climate change and its impact? 4. How strong and urgent is the need to look at climate change holistically, and its interlinkages with other SDGs, particularly natural disasters, water scarcity, non-communicable diseases, urbanisation and migration trends? Is climate change only an environment issue, or are there also economic, social, human rights, and cultural aspects? How can the political narrative regarding a country’s political responsibility to fulfil its commitment to implement the Paris Agreement be expanded by exploring interlinkages to other SDGs, and subsequently also help find sustainable solutions to these goals?